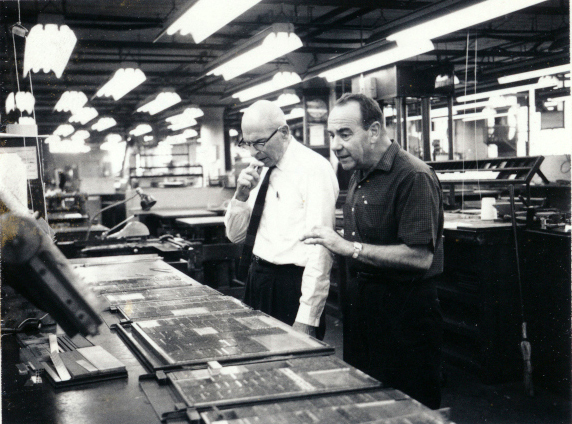 Morris Watson and Sidney Roger review an issue of The Dispatcher at press time. Watson was the founding editor of the paper. He was succeeded by Roger when he retired in 1966. The ILWU International began publishing The Dispatcher in late 1942 when it became clear that the union needed its own newspaper. Prior to that, general ILWU news was published in the Voice of the Federation, the organ of the Maritime Federation of the Pacific. Warehouse Division news was published as a special section to the Labor Herald, the publication of the Congress of Industrial Organizations (CIO) in California. Still a young union at the time of the paper’s inaugural edition, the ILWU was faced with a number of challenges that were more effectively communicated through a paper of its own. The expanding waterfront workforce of World War II was rapidly changing the union, growing its numbers and expanding its demographics; meanwhile, the ILWU’s leadership was under continued attack, and its leader, Harry Bridges, faced ongoing deportation threats. The Dispatcher provided members with a trustworthy and worker-focused source of reporting of these and other issues of importance. Throughout the years, news from the locals, stories on national and international affairs of interest to Labor, and regular columns from officers helped ensure that the democratic ILWU maintained an informed rank and file. Though it has gone through many changes throughout the years, The Dispatcher remains a vital central source of news and commentary of importance to ILWU members. The ILWU Library has a complete index of articles from The Dispatcher through 1985.